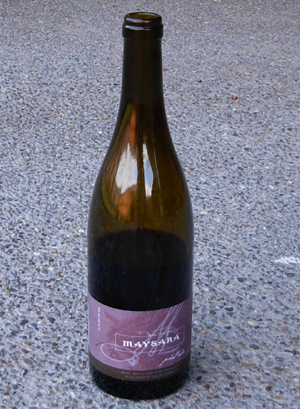 I joined the Maysara Winery “Tinoosh” wine club. Our first shipment arrived last week. It include two bottles of their first pinot noir, the 2001 Willamette Valley Reserve. It combined the fruit of three different vineyards. While it had the cherry elements I expect of the Yamhill Valley region, it definitely didn’t have as smooth of a finish as we like. My husband and I bought several bottles of their Jamsheed pinot noir vintage the past two years. Maysara practices Biodynamic agriculture, which meets or exceeds organic standards. They do not use chemicals and fertilizers and minimize outside “inputs” into the farm by integrating livestock and insectory plants into the vineyard. We’ve seen free range turkeys grazing next to the winery on our visits. But what attracted us to Maysara was their fantastic wine tasting events, held Memorial Day and Thanksgiving weekends. They pair their wines with samplings from a whole meal you could enjoy with each wine. You can nibble your way to heaven at these events. Maysara was founded by Moe and Flora Momtazi, emigrants from Iran. This family winery combines their ancient traditions and foods with a biodynamic vineyard set in the foothills of the Oregon Coast Range just south of McMinnville, Oregon. This is a longer drive for us than to visit our favorite Dundee wineries. But the food and the wine make it worth the trip.